DESCRIPTION: Victorian style home which was previously a bed and breakfast. 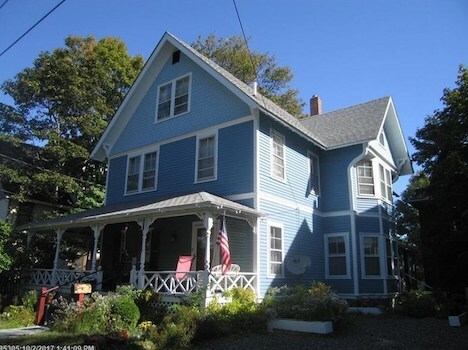 Located right in downtown Bar Harbor, restaurants, shopping and the ocean are all within walking distance. Large wrap around porch is great for grilling, socializing and relaxing. LAYOUT - FIRST FLOOR: Large entry leads to a living room with flat-screen TV. From Living area, a Master Bedroom with king bed and private bathroom w/ shower. Dining room with table that seats 12 plus small table that seats four additional guests. All new kitchen with stainless appliances, granite counter tops, and all new floors. SECOND FLOOR: Bedroom with king and en suite full bath. Bedroom with queen and en suite 3/4 bath with shower. Bedroom with queen and en suite 3/4 bath with shower. At end of hall, near third floor stairs is a shared full bath with tub and shower. THIRD FLOOR: Small bedroom with full bed. Shared 3/4 bath with shower. Bedroom with 2 twins. Large bedroom with queen and sitting area.